We’d love your help. Let us know what’s wrong with this preview of Language in Thought and Action by S.I. Hayakawa. In an era when communication has become increasingly diverse and complex, this classic work on semantics—now fully revised and updated—distills the relationship between language and those who use it. Renowned professor and former U.S. 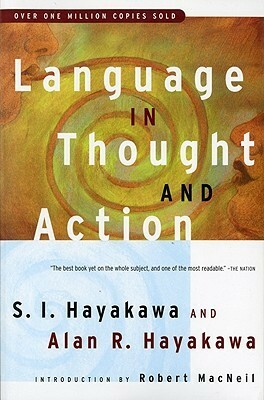 Senator S. I. Hayakawa discusses the role of language in human life, the many functions of language, and how language—sometimes without our In an era when communication has become increasingly diverse and complex, this classic work on semantics—now fully revised and updated—distills the relationship between language and those who use it. To ask other readers questions about Language in Thought and Action, please sign up. Linguistics schlinguistics… this is also a book about politics and public policy (Language in Thought and ACTION), and the best one about either subject that I’ve ever read. It gives me hope that there is possibility for greater cooperation among us all, despite all of our real and, more importantly, perceived differences. Yeah, there’s a lot of “common sense” in there, but it’s put in a framework that makes it much easier to identify and understand how others are speaking or thinking. I suppose Linguistics schlinguistics… this is also a book about politics and public policy (Language in Thought and ACTION), and the best one about either subject that I’ve ever read. It gives me hope that there is possibility for greater cooperation among us all, despite all of our real and, more importantly, perceived differences. I suppose an important message from the book is that by understanding when someone is speaking emotionally or misabstracting or whatever, you, as a listener, should be able to identify that and not take their words as literal, and maybe try to understand what they REALLY mean and eventually hold hands around the campfire and sing Kumbaya since by that point you’ve gone on together to solve all the world’s problems. For me however, it just meant for the first couple years after reading this book, I wanted to tell anyone who overgeneralized that were on the wrong rung of the abstraction ladder. Wow! This was great! Answers such questions as, why do we have language at all? How do words and the things words represent get mixed up by our brain? How does all of this impact our lives, and our civilizations? Perhaps I'm just new to reading about semantics, but I found the book's subject matter highly engrossing. Along the way it also systemizes a lot of common sense notions of language. Admitting my ignorance of Wittgenstein, this sounds a lot like him. The book also reminded me of the Black Wow! This was great! Answers such questions as, why do we have language at all? How do words and the things words represent get mixed up by our brain? How does all of this impact our lives, and our civilizations? Perhaps I'm just new to reading about semantics, but I found the book's subject matter highly engrossing. Along the way it also systemizes a lot of common sense notions of language. Admitting my ignorance of Wittgenstein, this sounds a lot like him. The book also reminded me of the Black Swan by Nassim Taleb because its very readable, results oriented, empirical, and the author is direct about what level of abstraction he is working at (and cares about such things as levels of abstraction). The first of the principles governing symbols is this: The symbol is not the thing symbolized; the word is not the thing; the map is not the territory it stands for. We all inherit a great deal of useless knowledge, and a great deal of misinformation and error, so that there is always a portion of what we have been told that must be discarded. It should be noticed that there are three ways of getting false maps of the world into our heads: first, by having them given to us; second, by making them up for ourselves by misreading true maps; third, by constructing them ourselves by misreading territories. But the cultural heritage that is transmitted to us—our socially pooled knowledge, both scientific and humane, has been valued principally because we believe that it gives us accurate maps of experience. To attempt to converse in this way is to make all our social contacts occasions for what we have earlier called “the pooling of knowledge.” We can, if we are able to listen as well as to speak, become better informed and wiser as we grow older instead of being stuck, like some people, with the same little bundle of prejudices at sixty-five that we had at twenty-five. If pictures give television its power, excessive reliance on them constitutes its weakness. Television news focuses on things it can easily symbolize visually, at the expense of things that are harder to depict. A few homeless people or a family being evicted can be televised to depict the larger problems of housing shortages and homelessness, but it’s hard to televise houses not being built, rents increasing, or employment declining. It’s easy to televise motorists in a gasoline line but hard to televise a national strategy for lessening dependence on imported oil. The visual aspect of television, adept at specifics, has trouble climbing back up the abstraction ladder to levels of greater generality and applicability. Language in Thought and Action shifted my thought process in so many ways. I'm able to extract much more quality information from conversations than ever before. An example of what you learn: we get information 2 ways, direct experience (extensional) and everything else (verbal). Extensional info gives us a VERY limited view of the world. I have no way of knowing Obama is a real person, that South America exists, or becoming a billionaire is a possibility. I learn about those things through verbal Language in Thought and Action shifted my thought process in so many ways. I learn about those things through verbal info (articles, videos, talking to people, news, books, associative memory, etc.). Verbal info is like a map that gives us an understanding of the real world. When we're equipped with accurate maps, we're prepared for living a more successful life and reaching our goals. When we have an inaccurate map, that's when we run into trouble. And we get inaccurate maps all the time. Stories of success coming to those who are 'passionate', that a toothpaste will make our teeth whiter, or that all we need is more "willpower" to succeed. Balanced biographies, scientific method, and approaching problems with a curious mindset all give us much more accurate maps to navigate our lives. Every time I crack this book open it expands my understanding of things I never used to pay attention to. Must read for anyone interested in improving their thought process and their lives. I'm interested in books that describe underlying patterns and apply to all aspects of daily living. EX: a book about language applies everyday and opens up your eyes to many new things. 1 star - I'm surprised I finished it. Will encourage people not to read at all. 2 star - Got some value out of it but not actively recommending. 3 star - Great book and you should read it if you've got some interest in it. I'm glad I read it but most likely won't read it again. 4 star - Excellent book that you need to read if it touches on your interest. Will recommend to others and maybe read again. 5 star - Everyone should read this book. I recommend it to others regularly and may buy a few copies to hand out. Will read again. I read a library copy of this book in high school, probably on assignment from my senior English teacher, Mr. Silkowski. It was the first book I'd ever read on communication theory and semantics other than Marshall McLuhan and it left far less of an impression, perhaps because it had been assigned by a teacher I didn't particularly like rather than recommended by an older friend whom I admired. The notion of General Semantics, however, I did find intriguing. This is one of the most enlightening books I have ever read. Hayakawa is the kind of incredibly bright mind whose writing can make you think more methodically, conclude things more confidently, and feel smarter yourself. Somehow he seems like a friend at tea - but his observations are so clear that you wonder how he can outside enough to notice all this, and inside enough to feel familiar and patient and maybe kind. Thus, this non-fiction book was far, far more of a page turner for me than most This is one of the most enlightening books I have ever read. Hayakawa is the kind of incredibly bright mind whose writing can make you think more methodically, conclude things more confidently, and feel smarter yourself. Somehow he seems like a friend at tea - but his observations are so clear that you wonder how he can outside enough to notice all this, and inside enough to feel familiar and patient and maybe kind. Thus, this non-fiction book was far, far more of a page turner for me than most books of fiction that I've read (and liked) lately. If he has a moral message it is unobtrusive, unassuming, and the kind of lesson that any reader who's heard any of what he's said simply must draw for herself. Come to think of it, he argues rather like lawyers should - so that the conclusion the author desires, never once spoken, is inevitable, obvious in the silence after the speech. Hayakawa compares any use of language to the practice of drawing a map of a physical territory. Depending on how good the mapmaker is and his motivations, that map can resemble the territory very reliably, or not at all. And from this simple metaphor he draws an impeccably conscientious account of the kind of things we do when we use language, and the implications for us as actors in the world. Someday I hope to have read it enough times that I can hold all the concepts in my head at once and provide something like a summary - but until then all I can say is that more than one of Hayakawa's descriptions rang true for me in a way that clarified things about myself and my world that I'd always suspected emotionally, but never been able to articulate. I think this book should be required reading in schools - I think we should all take courses on how we use language, why we use it those ways, what it says about us that we do, and--especially--how our ways of using language affect our ways of thinking and, ultimately experiencing and behaving in the world. This book is an interesting, concise, and well-written book about linguistics, particularly semantics. It particularly deals with how we know what we know, and how we frequently systematically misunderstand or miscommunicate because of limitations of language - or our use of language - for conveying what we mean. In many ways, it is about the evolution of prejudice in individual minds as a consequence of confusing levels of abstraction, so that "Pigs are dirty" implies that Hampton is dirty beca This book is an interesting, concise, and well-written book about linguistics, particularly semantics. It particularly deals with how we know what we know, and how we frequently systematically misunderstand or miscommunicate because of limitations of language - or our use of language - for conveying what we mean. In many ways, it is about the evolution of prejudice in individual minds as a consequence of confusing levels of abstraction, so that "Pigs are dirty" implies that Hampton is dirty because Hampton is a pig, even though Hampton has always demonstrated excellent hygiene. The problem is that "Hampton" is a specific pig, being observed at a specific time, and is at a different level of abstraction than "pig" in general (or even "farm animal" or "animal" or all kinds of other categories you could put him into). Even if my whole experience of pigs leads me to believe they are dirty, my experience remains limited, and I may err in applying the trait to Hampton. Unwillingness to let Hampton be clean is a prejudice related to cognitive inflexibility - often related to the inability to see different levels of abstraction for what they are. The characteristic metaphor here is that "maps" - levels of abstraction - fail to correspond to "territories." He details the differences between reports, inferences, and judgments, which are easily confused, at times with significant consequences. The book does not entirely dwell on the negative. It has interesting discussions of the ways we use talk ritually. In such instances, the words have little to do with what is communicated, or why the words are said. These analyses are well-done and instructive. Towards the end of the book, Hayakawa turns from describing the more basic aspects of representing information to the ways certain systems of representation - such as television - change our perspective and understanding in ways that might not be desirable. He describes the effects of television on advertising, human motivation, and politics. He ends with a discussion of "cultural lag," which is a sociological term for "the continued existence of obsolete institutional habits and forms." The characteristic metaphor is having "horse and buggy" ways - living as though one's social conventions were appropriate even though technological and social advancement have changed the entire landscape for social interaction. I highly recommend the chapters "Reports" and "Affective Communication". The former gives good advice for objective writing, i.e. writing in such a way that pretty much everyone will agree with you. The latter is a highly insightful survey of literary devices: what they do, why they work. You might like reading those chapters even if you don't read the rest of the book. The idea of the "abstraction ladder" rings true. It's one of those concepts that you might not notice until someone points it out to you, but after learning about it you can find applications for it everywhere. Being aware of the levels of abstraction of words being used will help with effective and efficient communication. - the absurdity of speech itself: "extremely complicated systems of sputtering, hissing, gurgling, clucking, and cooing noises"
Much of the book is structured around a fundamental division of meaning into "extensional" (real-world) and "intensional" (inside the mind). Something about this classification feels wrong to me, perhaps because, in a sense, even real-world objects exist only inside the mind. This philosophizing may seem like splitting hairs, but there's a lot of epistemology in this book and such questions become important. On a related note, the book feels somewhat dated. It was written during World War II, and I suspect that more recent linguistic publications may have a more nuanced and better structured understanding of the concepts in this book. That is the main reason for the three-star rating. Also, the book has some questionable language about women and "savages". -There is a level of abstraction for everything, a cow is a process referring to the organism (low) which is a bundle of cells (lower) that is livestock (high abstraction) that is considered a farm asset (very high). Each level of abstraction bundles it with other things, farm asset includes tractors and buildings with the cow, and its name would isolate only the particular cow (process we call cow). -Close minded people can either do 1. or 4. Open minded people are able to do any of the 4. Intensional is being guided by the words and what we think they mean solely- Assigning words like "churchgoer" to other traits like good, kind, christian, etc. without knowing anything else about the particular "churchgoer"
Overall don't let words and semantics twist up the "terrain" don't sell yourself or anyone else a false "map" and stick to the facts. Also, "A truth told with bad intent, beats all the lies you can invent." Read this book -- It helps to open one's mind! 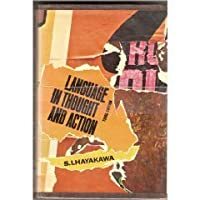 : S. I. Hayakawa's "Language in Thought and Action" is an excellent read. There isn't much that I can add to what has already been said by other reviewers. In terms of writing and speaking, this book will help me to remain cognizant about the words I use, their meanings, and their contexts. As a reader of books, articles, ads, etc., as well as one who "listens" to what others are saying, this book will help me to recognize that I must discern the "me Read this book -- It helps to open one's mind! 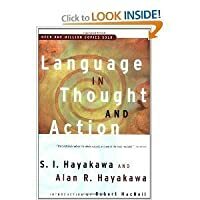 : S. I. Hayakawa's "Language in Thought and Action" is an excellent read. There isn't much that I can add to what has already been said by other reviewers. In terms of writing and speaking, this book will help me to remain cognizant about the words I use, their meanings, and their contexts. As a reader of books, articles, ads, etc., as well as one who "listens" to what others are saying, this book will help me to recognize that I must discern the "messages" I am receiving, in terms of their intended meaning by the writer and/or the speaker. While the book is very profound and thought-provoking, Hayakawa's style is not erudite -- that is, he does not talk "down" to the reader. I intend to re-read this book many times, in order to glean more of Hayakawa's important message. What remains is to try and get more people to read this excellent work, including relatives, friends, those in government, scientists and engineers, academics, media types, and those in the entertainment industry. If I could give this book more than five stars, I would do so without hesitation. In my mind this book should be required reading for all freshman in college ... and then they need to reread it again just before they graduate ... just in case they were not yet emotionally prepared for the depth of this work as freshman and to strengthen its message as they step out into the world as "adults". This is one of perhaps a dozen books that has had and immense impact on how I view the world and my relationship to it. It taught me to question the words both I and others use and to und In my mind this book should be required reading for all freshman in college ... and then they need to reread it again just before they graduate ... just in case they were not yet emotionally prepared for the depth of this work as freshman and to strengthen its message as they step out into the world as "adults". This is one of perhaps a dozen books that has had and immense impact on how I view the world and my relationship to it. It taught me to question the words both I and others use and to understand that communication is not only difficult but fraught with pitfalls and blind alleys. It reinforced in me the concept that we need to try to look at the world through the eyes of others, and that how we and they "see" the world is to a large extent shaped by the language each of us uses to describe it. Linguistics for the average person and day to day life situations. A good refresher for anyone that uses a language... Here are some notes I took, this isn't a formal review. The habit of guiding ourselves by words alone, rather than by the facts to which words sh A good refresher for anyone that uses a language... Here are some notes I took, this isn't a formal review. The habit of guiding ourselves by words alone, rather than by the facts to which words should guide us. Abstractions; television, drawings, photographs, live theatre, the studio of "The Tonight Show" is so small. One of the lessons of war is that institutions, while powerful and long lasting, are often not insuperably rigid if the emergency is great enough. "what will be the results?" "Who will benefit, and by how much?" "Who will be harmed, and to what degree?" "What safeguards does the proposal contain to prevent further harm?" "Are people actually ready for such a measure?" "What will be the effect on prices, on the labor supply, on public health, on the environment?" "And who says so, on the basis of what kind of research and what kind of expert knowledge?" From extensional answers to such extensionally directed questions, decisions begin to flow. "The most striking characteristic of science has been its continued success in the solving of "insoluble" problems." The book opened my mind about language and how it's use affects us. It explained ways how we make conclusions too fast by abstracting based on some unique previous experiences in our lives, or based on distorted media representations, etc. I learned to be more conscious and cautious about my own abstraction processes, going on in my mind. Sometimes it is better to have concrete examples or ask concrete examples from other people when they're trying to explain something abstract. Else you can get The book opened my mind about language and how it's use affects us. It explained ways how we make conclusions too fast by abstracting based on some unique previous experiences in our lives, or based on distorted media representations, etc. I learned to be more conscious and cautious about my own abstraction processes, going on in my mind. Sometimes it is better to have concrete examples or ask concrete examples from other people when they're trying to explain something abstract. Else you can get stuck in an infinite circle of abstraction, everybody thinking about slightly different things when saying the same words. As difficult and tedious as I sometimes found this to read, it had many interesting moments. I actually “accidentally” picked up this book, thinking it was about something else, but I continued reading it anyways out of sheer interest. This book was less a discussion about language and more a discussion about humanity and it’s habits. If I had to sum up the book in 6 words, it’d be: Quite interesting, but tedious to read. This book is great -- my only regret is that I have not read it earlier. I specifically sought out and bought an older edition (3rd) on Amazon due to hints from some of the reviewers that some parts the later editions were subjected to politically correct castration. Das Buch hat viele interessante Ansätze. Leider irgendwie nicht zu Ende gedacht. Es fehlte mir an Content. A linguistic classic. Dated, but based on an insightful understanding of human understanding. Although a linguist friend didn't think much of Hayakawa's book, I found it very thought provoking, and therefore meaningful. "A classic is a work which gives pleasure to the minority which is intensely and permanently interested in literature. It lives on because the minority, eager to renew the sensation of pleasure, is eternally curious and is therefore engaged in an internal process of rediscovery. A classic does not survive because of Although a linguist friend didn't think much of Hayakawa's book, I found it very thought provoking, and therefore meaningful. "A classic is a work which gives pleasure to the minority which is intensely and permanently interested in literature. It lives on because the minority, eager to renew the sensation of pleasure, is eternally curious and is therefore engaged in an internal process of rediscovery. A classic does not survive because of any ethical reason it does not survive because it conforms to certain cannons, or because neglect would kill it. It survived because it is a source of pleasure and because the passionate few can no more neglect it then a bee can neglect a flower. The passionate few do not read "the right things" because they are right. That is to put the cart before the horse "the right things" are the right things solely because the passionate few like reading them …"
"Nobody at all is quite in a position to choose with certainty among modern Works. To sift the wheat from the chaff is a process that takes an exceedingly long time. Modern Works have to pass before the bar of the taste of successive Generations semicolon whereas, with Classics, which have been through the ordeal, almost the reverse is the case. Your taste has to pass before the bar of the classics. That is the point. If you differ with a classic, it is you who are wrong, and not the book. If you differ with a modern work, you may be wrong or you may be right, but no judge is authoritative to decide your taste is unformed. It needs guidance and it needs a thority of guidance." Stumbled upon this book (although one of a different edition) in the school library and was hooked on it, so I went and bought a copy. Hayakawa has the ability to lay out his ideas in a simple and lucid form. A very insightful piece of work, that elucidates things you've always known, but never realized. Countless 'lightbulb moments'. I first read this book from 15 October 2011 to 22 March 2012, and the above was my review from that reading. One and a half years later, I'm going to give one of my Stumbled upon this book (although one of a different edition) in the school library and was hooked on it, so I went and bought a copy. Hayakawa has the ability to lay out his ideas in a simple and lucid form. A very insightful piece of work, that elucidates things you've always known, but never realized. Countless 'lightbulb moments'. I first read this book from 15 October 2011 to 22 March 2012, and the above was my review from that reading. One and a half years later, I'm going to give one of my favourite books a re-read, and it's equally, if not more, edifying this time round. I've tried to be more fastidious in my book ratings this year, but I cannot give this book anything except a five. Not only does Hayakawa elucidate concepts about words and language, he actually exhorts the reader to utilize the language in such a way as to promote forward thinking and proper action. I absolutely loved his section about language in action, because when we internalize and think about what we speak, he suggests that we are actually making the world a better place. By being rigorous with the language that we think, and by being rational and purposeful with the language that we speak, he suggests that cooperation among ourselves will be bettered. Bought it thinking I was getting a book from the 40s, anticipating a meaty discussion of language from the perspective of another era. Turns out it is a 1990s revision with all the associated inanities. Full of truism and littered with falsities. Offers some very basic concept about language suitable for high school level. But some of it is clearly wrong to the point of delusional. For example, it proposes that to create more patriotic feeling, we should educate student with all the details of d Bought it thinking I was getting a book from the 40s, anticipating a meaty discussion of language from the perspective of another era. Turns out it is a 1990s revision with all the associated inanities. Full of truism and littered with falsities. Offers some very basic concept about language suitable for high school level. But some of it is clearly wrong to the point of delusional. For example, it proposes that to create more patriotic feeling, we should educate student with all the details of democratic institutions. That would be much more effective than pledging to the flag. If that were true, universities would be bastions of patriotic ferver and roadside bars full of internationalists. The book is full on straw men and ends with a stirring sermon on how government would be so much better if elites made all the decisions without 'ideological' input. This is my favorite book regarding language. I was an English major in college. We had a lot of books we had to read, and this wasn't one we picked. A lot of the theory from philosophers that I learned was interesting, but I failed to see how it applied directly to my life. This book did the opposite, and I wish I had found it during college so I could share it with my professors. This book talks about the most common times that miscommunication occurs. He breaks down what is happening in those s This is my favorite book regarding language. I was an English major in college. We had a lot of books we had to read, and this wasn't one we picked. A lot of the theory from philosophers that I learned was interesting, but I failed to see how it applied directly to my life. This book did the opposite, and I wish I had found it during college so I could share it with my professors. This book talks about the most common times that miscommunication occurs. He breaks down what is happening in those situations, and gives the reader tools to use in their everyday life to communicate more effectively. Still, it doesn't read as a self-help book. It's very academically written, and the topic is applicable to everyone in every setting because we all have to communicate. For that reason, it is easy to apply the topics covered to the situations we find ourselves in constantly. This book gave me some wonderful pearls of wisdom and functional models to improve the way I communicate. All in all it was an easy read and made the concepts of General Semantics very approachable. The book seemed to digress a bit in the last third or so into more sociological topics. And for a while I was left thinking that the book was losing its focus a bit. But eventually the author tied those ideas that were floating away back into the topic of the book by being clearer about the fact that This book gave me some wonderful pearls of wisdom and functional models to improve the way I communicate. All in all it was an easy read and made the concepts of General Semantics very approachable. The book seemed to digress a bit in the last third or so into more sociological topics. And for a while I was left thinking that the book was losing its focus a bit. But eventually the author tied those ideas that were floating away back into the topic of the book by being clearer about the fact that he was giving examples of what can happen in society when less than appropriate communication models are used in the wrong way. Samuel Ichiye Hayakawa was a Canadian born American academic and political figure of Japanese ancestry. He was an English professor, served as president of San Francisco State University and then a United States Senator from California from 1977 to 1983.